Dorsett Putrajaya Makes Its Debut with A Big Bang! Dorsett Putrajaya, managed by Dorsett Hospitality International, opened its doors on 16th of January 2015 with a soft launched last month. 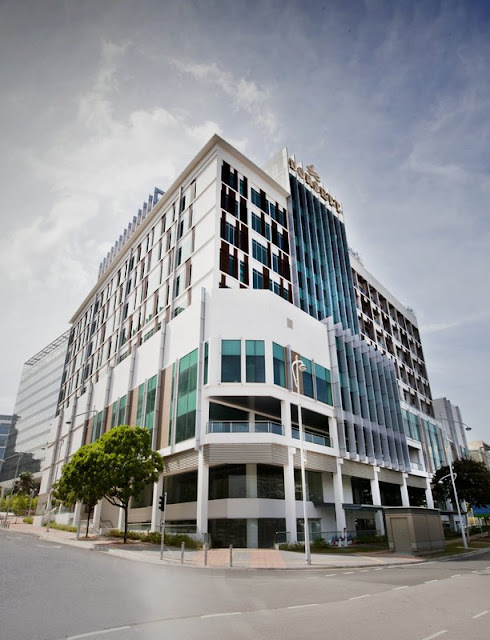 The latest addition to the Dorsett Group, Dorsett Putrajaya is located in the heart of the federal administrative capital at Precinct 3 in Putrajaya. The 218 rooms urban midscale hotel debuted with a soft launch graced by Yang Berhormat Datuk Dr Loga Bala Mohan, Deputy Minister of Federal Territories, and many more distinguished honorary guests and members of the media. Greeting everyone at the hallway to the entrance of the hotel were multi-racial groups of our nation’s traditional musical performers of Kompang and Tabla, enhancing the ambiance with roaring big bangs of welcomes. The soft launch kicked off with emcee, Dato' Mahadzir Lokman leading the event and speeches by the day’s honorary and distinguished VVIPs. The launch was further advocated with the blessing of a pair ‘Lions’ that symbolizes abundance and prosperity for Dorsett Putrajaya. Together with the with background percussion symphony of Chinese Drums, the Malay Kompang and the Indian Tabla, the VIPs along with General Manager officiated the launch with the ceremonial act of blessing by looking into the Lion’s Eyes and receiving the heavenly scroll of prosperity and success. After all the performances, Mr. Alfred Paulsen presented the First Guest Award to Associate Professor Doctor Nor Fadilah Rajab for being the first guest of Dorsett Putrajaya. This was followed by a few Lucky Draws that included a grand prize of 3days 2nights Dorsett Suite Package at Dorsett Tsuen Wan, Hong Kong with return flight ticket courtesy of Malaysia Airlines Berhad for two persons. Ideal for leisure, business and conferences, Dorsett Putrajaya is located within walking distance to key Malaysian government offices and several places of interest, and adjacent to the Festival Mall, the latest food and retail mall which is scheduled in March 2016. The hotel is features multiple dining option and meeting facilities as well as an infinity pool, rooftop bar and gymnasium with the scenic lake view as its backdrop. With the Putrajaya ERL Station just a mere 10-minute drive away and only 30-minute drive to Kuala Lumpur International Airport, Dorsett Putrajaya is indeed the latest gem in Putrajaya.